Sometimes a fabric range comes along and it is just magical - just the perfect prints in the most delicate and beautiful colours. Amy Sinibaldi's first fabric range - Paperie for Art Gallery Fabrics is just stunning. I was so excited getting to work on this Blog Tour with these prints. 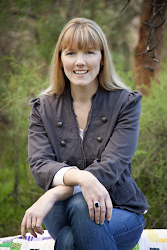 I have been a long time fan of Amy and her creative work. She has such an inspirational style all of her own and this range just exemplifies this. This range, inspired by her love of books showcases individual prints that match and co-ordinate in harmony with one another. Striking dark colours that perfectly compliment the softest pinks and peaches . And can I say that her "Stamped" text print is about to become my new favourite background print. As soon as my bundle of fabric arrived I quickly set about sewing one of my "Cotton Reel Pincushions" while I decided what larger project I would make from these prints. This Butterfly Charm Block was the start for an Undercover Maker Mat. I have been wanting to make this pattern since I first saw Nicole's from Lillyella make hers. Paperie worked beautifully to create the individual pockets and Mat. 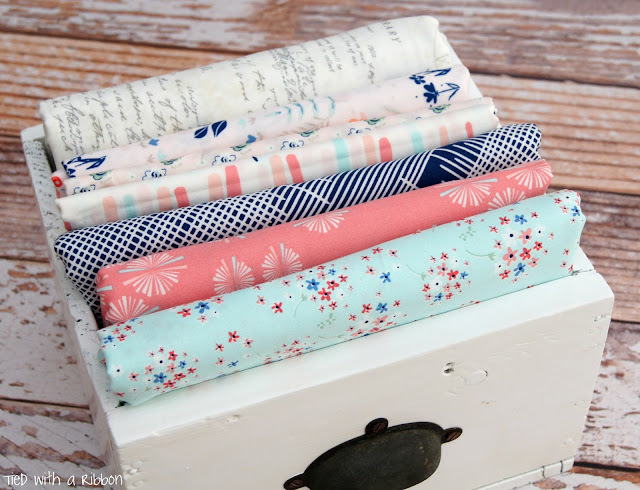 I just adore this range and I know it is going to be a well loved fabric addition in your stash. I have several other projects planned for Paperie to add some other accessories and I think my girls would love a dress made with this range. If you would like to win a pack of Charm Squares from Amy, then head over to my Instagram account @tiedwitharibbon and leave a comment. If you are not on Instagram then leave a comment below as to what you make like to make from these sweet fabrics to enter. Winner will be chosen at random. 1 comment per person please. EDIT - Giveaway now closed and winner has been announced by random number pick from all comments and IG comments over on IG. 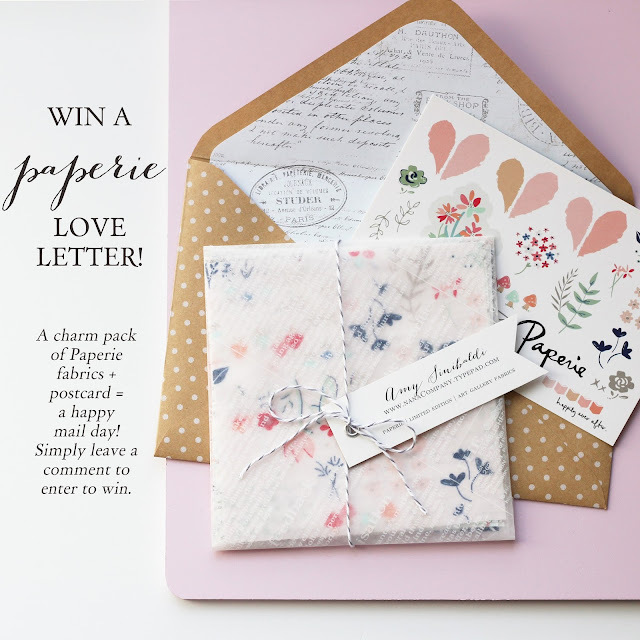 Would love to be entered in your drawing for the Paperie Love Letters. I just found your blog this week and have been enjoying it so much!! The projects you have done with this fabric line are wonderful and so creative. 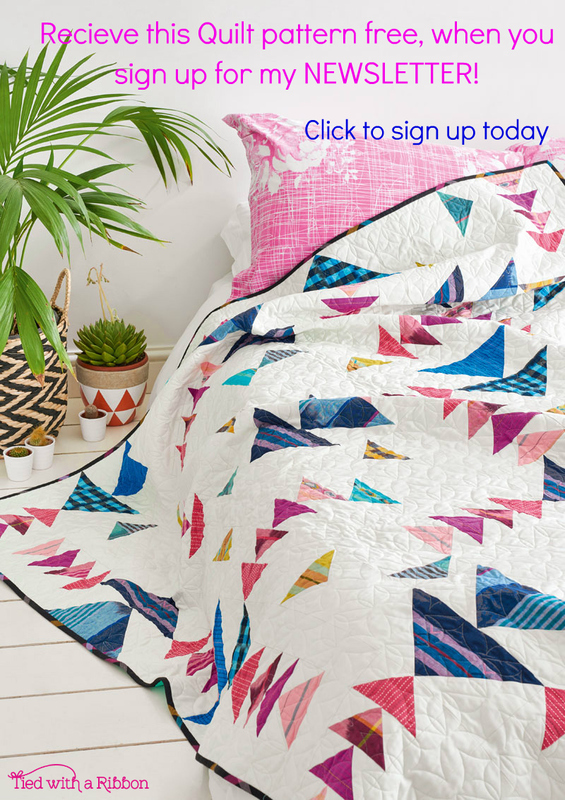 I'm still too new to quilting to attempt the Undercover Mat- that is stunning! I would LOVE to make a Valentines table runner with that pretty charm pack though. Btw, I love your neat, pretty work area! So cheerful! Thanks! I love all your creations,I think the Undercover mat,will be a sweet sewing project for my granddaughter,Mckenzie Lee to make on her new sewing machine! I'm loving all the creativity with Amy's fabric, Paperie. The butterfly square is beautiful. Thank you for the chance to win a charm pack. What a wonderful use of the Fabrics, thanks for sharing. Your Undercover mat is stunning! You did such an awesome job. Love your sweet pincushion too.Paperie is the prettiest fabric line ever!!! Lovely projects! The actual size of the butterfly surprised me after seeing it close up -- impressive! I would love to make pincushions with this fabric to give as gifts, or a sweet little dress for a girl. Thank you for offering this giveaway! Love Amy's fabric line! 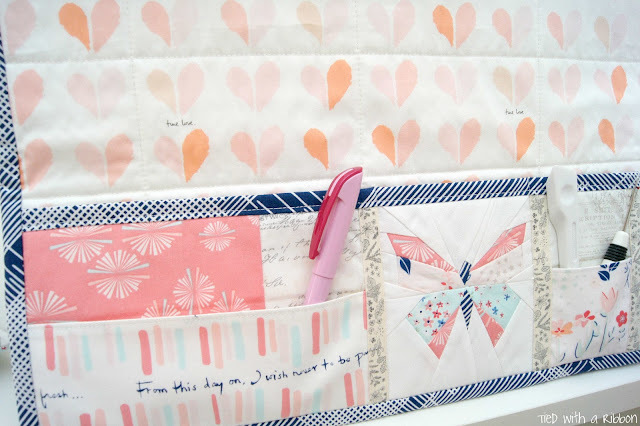 Your sewing may is perfect and I especially love the butterfly block! I love what you made with this line. It seems to fit the style of the fabric perfectly and your butterfly is beautiful. I'd like to make a few pouches to hold my sewing notions with this line. Wow, this is beautiful! It would be happy mail indeed to win this. I think I might make a few pincushions and maybe some mug rugs. Thanks for the opportunity to win! I'll just have to sew an Undercover Maker Mat! Your Undercover Maker Mat is gorgeous and I think I need to try to make one. I would also like to make a pillow and pincushion with this collection. Maybe something from hexies too! I love your butterfly and the Undercover Mat truely beautiful! With a charm pack I would make a cute little doll quilt something really simple like nine-patches to show this cute little fabrics! I would love to make a baby quilt for my 6-month old daughter... Isn't it the perfect collection for little girls? ... Can I be considered a little girl and make a quilt for myself? I like your projects. I would make a lap quilt with the charm pack. Thank you for the inspiration and the giveaway. HI,love your Butterfly Block! such a pretty giveaway>Thank You! I would love to make this mat! It is gorgeous! I just love the butterfly! I love all you have done with this fabric! It looks soft and lovely. Love the idea of the mat and the fabrics you used. I need to think about making one of those too. Thanks. Beautiful projects. I would happily replace my plastic sewing machine cover with this stunning mat! Really enjoying the blog tour and so far want to make everything!! Would love to win a charm pack. I am not on instagram...but I love this line! I want to make a quilted pillow cover. I would make a dress out of these fabrics too! not sure which one. Love your blog and love this new fabric line! Can't wait to start following you on Instagram as well! I would make lots of yo yos. I love everything that Amy makes her work is stunning. 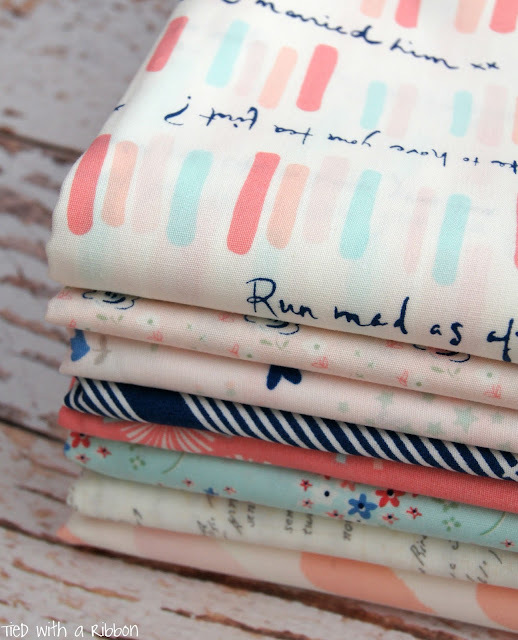 Her fabric line is so very pretty and I would make some for myself - like a bag or a cushion. Love your undercover mat! I think I really need to make one for myself. Paperie is a beautiful collection. I think I would make a small quilt for my next grand baby. Thanks! This fabric is so lovely. I would love to make a huggy blanket for my granddaughter. I have already purchased some of this fabric, and it is luscious! I love this fabric line and I would love to make a machine mat with pockets like you did. Love the butterfly. This fabric is perfect for it. I would add enough other fabric to make a sweet lap quilt. This fabric is so delicate and light. Wonderful. I think a little "envelope/love letter" wall-hanging mini quilt would be ideal to make from this charming fabric. I absolutely love the cover for your machine with the handy pockets! I would either make a quilt for my 8 month old grand baby, or perhaps some doll clothes. Love all your projects with this gorgeous fabric! I think I'd make some pouches with these. Sweet fabrics. I would love to recreate what you made, it is just precious. I am planning to make some sweet valentines gifts for my grandbebes. Oh my gosh, I love everything you make! Your butterfly ready shows off Amy's fabric, it's beautiful! I would probably make my daughter a new ballet bag - hers is on its last legs! I would make a charming mini-quilt to use as a wall hanging in my sewing room. These colors are so feminine and sweet! I love the fabrics. I am not sure what I would make from them. Maybe a string quilt. The colors are so soft. Thanks for the opportunity to win. I don't have instagram and would love to enter the giveaway. I think the charms would make a great pillow. I would make a table runner for my toddler class snack table...they would love the colors and patterns! It's really nice to meet you via blog and appreciate your quilt works. 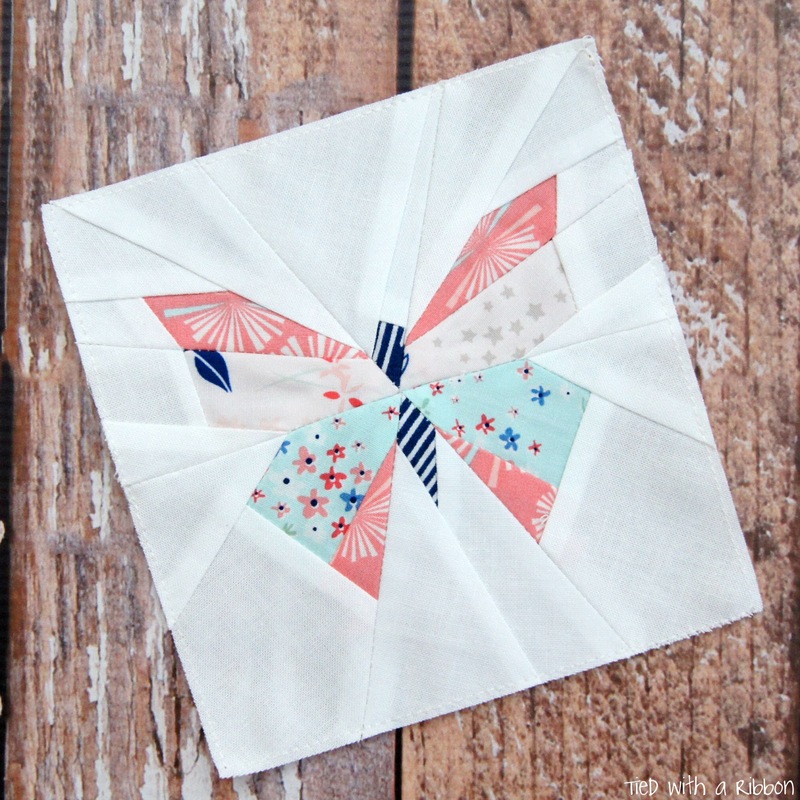 Love the undercover mat and in particular the paper pieced butterfly charm block..oh so...so beautiful. 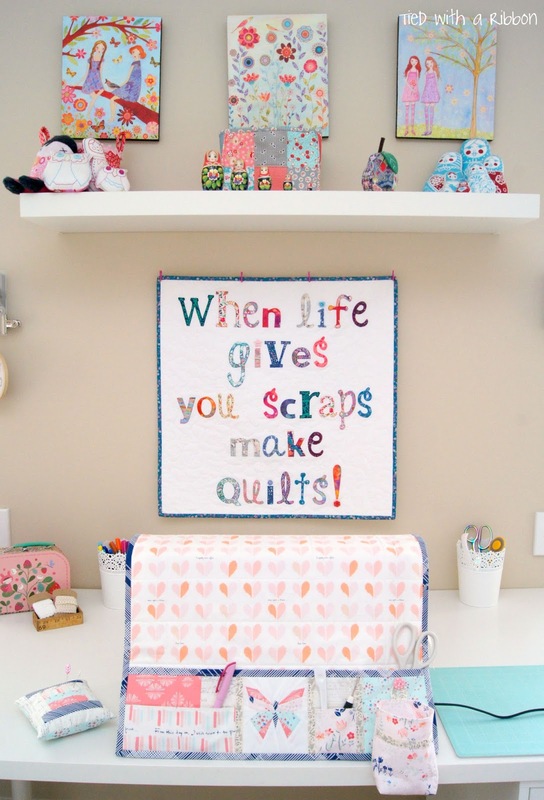 Your motto "when life gives you scraps, make quilts" is so fun and so very true. Quilting makes it all better. Thank you for sharing. Lovely fabric - i would make a charm box quilt. 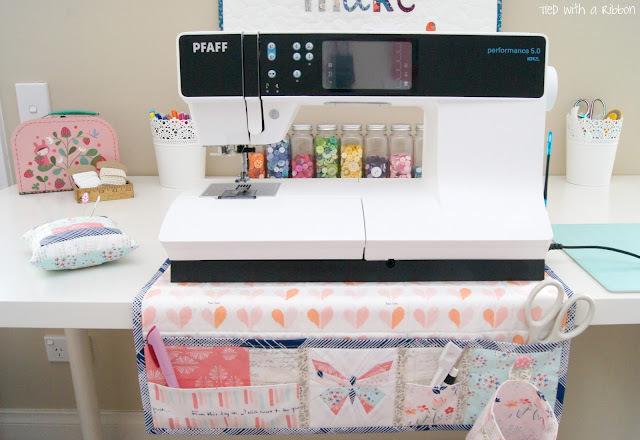 Love the sewing machine mat! I've been wanting to make a sewing machine mat! You can pick me please! Thanks for including those of us who aren't on IG. 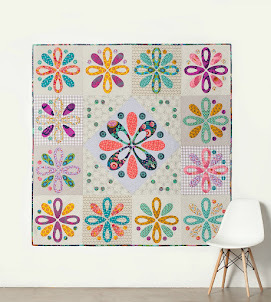 I would love to add the charm pack to my Art Gallery stash and see how well they mix and match together to make a quilt and a matching throw pillow! This collection is delightful. A small quilt for a little girl would be the perfect platform to showcase it's appeal. I love your projects, especially the wall hanging behind your machine. Everything that Amy touches turns out simply stunning. Thank you for the inspiration. 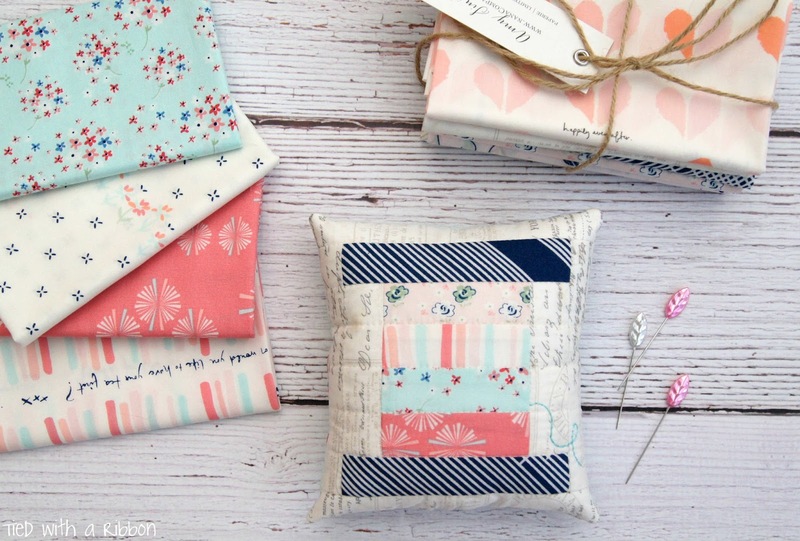 Such lovely fabrics, and your project is gorgeous! I would love to make a baby quilt from this line. Just found your blog... LOVE It! The fabric is soo beautiful! 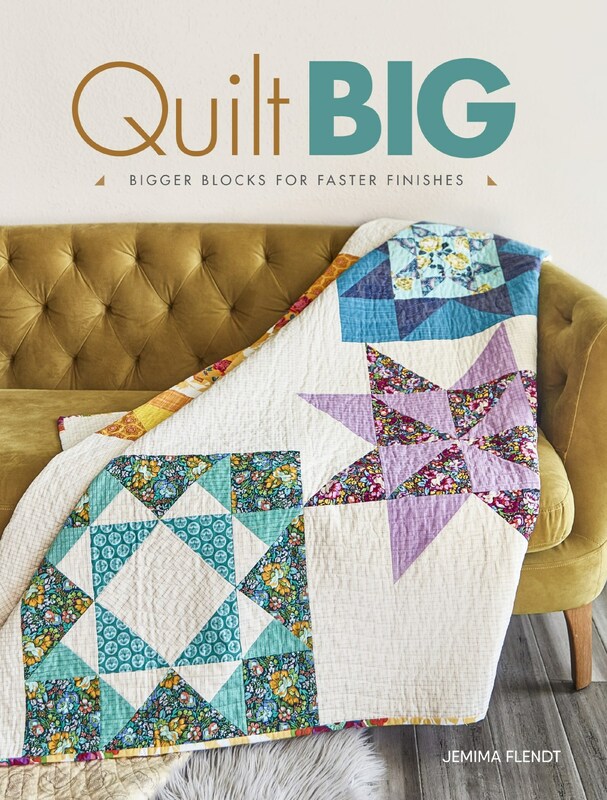 Would love to do a mini quilt with these fabrics!! !